These salmon and quinoa cakes cook in no time. I love them with cheats sweet and sour. I love making these Salmon Quinoa Cakes. It’s probably the nicest way to eat quinoa that I know. 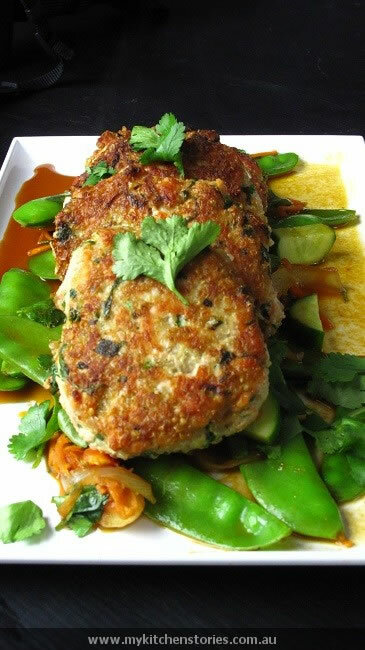 Its disguised in these delicious Salmon Cakes that have a bit of an Asian flavoured twist. I am going to say these might be the easiest and tastiest fish cakes you are ever going to make. Don’t forget to make the quick and easy cheats Sweet and sour vegetables to go with them. This is a quick and very easy dish. Kids will love it and cooks will love it too. Add all of the fish cakes ingredients into a mixing bowl and mix well. The mixture will not be runny or too loose to hold the patties shape. If it is, add a small amount of breadcrumbs. Heat a shallow fry pan with 1 cm of oil and fry till browned on one side , Flip. They will only take a couple of minutes each side. Do not cook too long. They will continue to cook while you make the vegetables. Heat another medium fry pan over high heat. Add the oil and onion and toss for 1 minute then add the garlic and ginger. Sauté till fragrant then add the stock, tomato sauce, sugar, sweet soy, and a little salt. Stir well and when it starts to steam and come to the boil add the grated carrot and the snow peas and toss till warm and the peas are only just wilting. Take off the heat and serve. Add some chopped coriander. Serve with rice or just by itself. 1 cup of quinoa once cooked makes 2 and 3/4 cups of cooked quinoa. This recipe calls for 2 cups of cooked quinoa. That means 1 cup of raw. 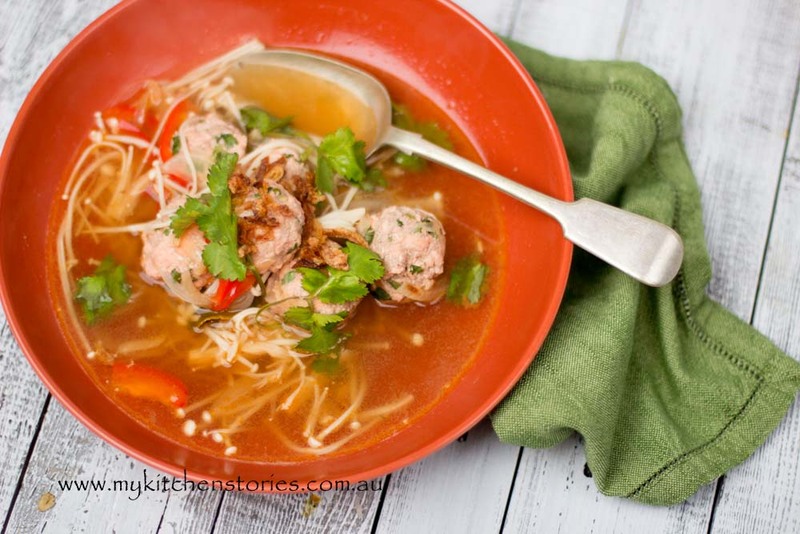 If you like the idea of this try my Salmon Hoisin Meatballs in Asian broth. It makes an even quicker dinner. I am sure there are endless ways to use Salmon mince. Let me know if you come up with a few more. I love reading all the IMK posts every month. Those salmon cakes look tasty – lucky you having access to the markets and such great produce. Your salmon and quinoa cakes look smashing! Hi Tania That coconut jam looks fab. I am certain the quince jam and the chocolates will taste gorgeous. Lucky you. Safe travels Tania! I can’t wait to read about your adventure. I must admit I’m rather jealous that you got to sample some of those chocolates of Celia’s I was practically drooling reading about them the other day. I’ve never seen salmon mince before. Love that salmon mince, I have not seen that before! And how about the chokkies from Celia… and Pete’s quince jelly. Wow! Enjoy your adventure, bon voyage! Mmph! A bit green around the gills! Love your recipe which will go into ‘Kitchen regulars’ before I even try! Oh to be closer to the Sydney Fish Market: that salmon mince looks delectable and not bad value!!!! And, I want that book: quite badly! Celia of course teaches something with every post 🙂 ! Penang and KL: huh – would SO have loved to be along . . . pretty please, lots of photos and descriptions!! Those look great Tania! The mince is fantastic and definitely great value. Lucky you to share Celia and Pete’s bounty, what are you going to do with the Quince jelly? G’day Tania! What a terrific kitchen view! Love the coconut jam! LOVE the combination of quinoa and salmon and LOVE Malaysia! Can’t wait to hear all about the food tour too! I am just a teeny bit jealous of those chocolates with peanut butter! 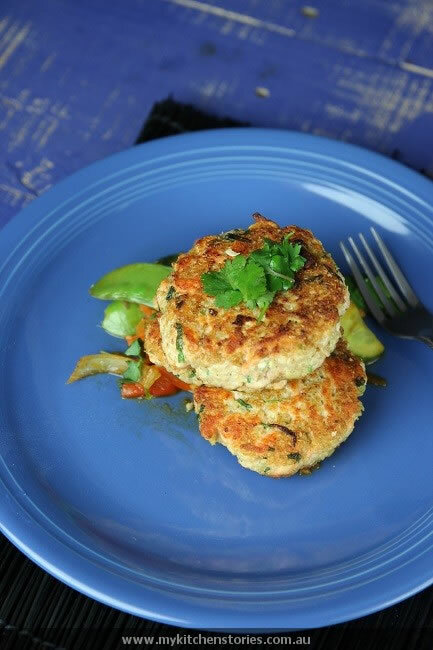 Gorgeous salmon cakes too – quinoa is such a great pattie ingredient. Enjoy the food tour!! I am soooo jealous at those Chocolates, made by Celia!! I love those salmon quinoa cakes! 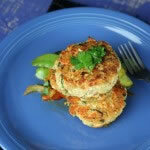 Your salmon cakes look spectacular! That salmon looks so good as do the chocolates. This recipe is perfect for me and I love that hit of green curry to enhance it. This looks delicious, I love the fact you have used real fresh salmon and not skimped on the tinned stuff. Nice one. Oh my goodness! Salmon mince? Salmon Laab? How fabulous! I’ll have to give an eye out for it 🙂 Have fun eating all of the tasty food in Malaysia! Thank you for a look inside your kitchen! Mostly I loved the salmon and quinoa cakes recipe !!! Yum! 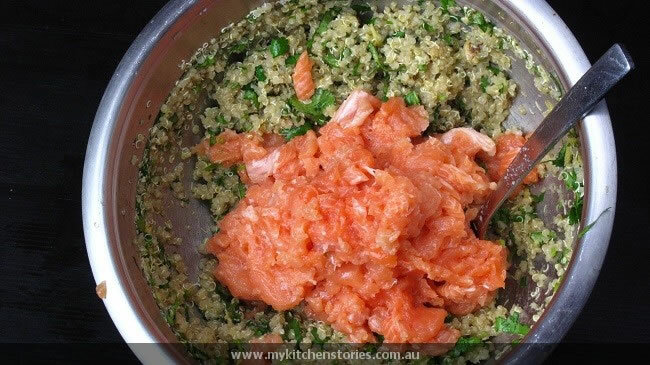 I never thought before to combine salmon and quinoa–what a great recipe. And I have so loved visiting Italy with you. Your photos are wonderful. I still have family there and love it as well. Your photos and posts have rekindled a longing to visit again. It’s been too long since I really journeyed there. I’m intrigued by that Coconut Jam – I’ve heard a few people talking and writing about it. I imagine it’s sweet (coconut and sugar go hand in hand in the tropics) so I like to think that this would be nice meared on a piece of brioche, with some cream perhaps. mmmm Enjoy your mini food break! By now you’re probably off and running, but I wanted to stop by and say how much I enjoyed your IMK post. 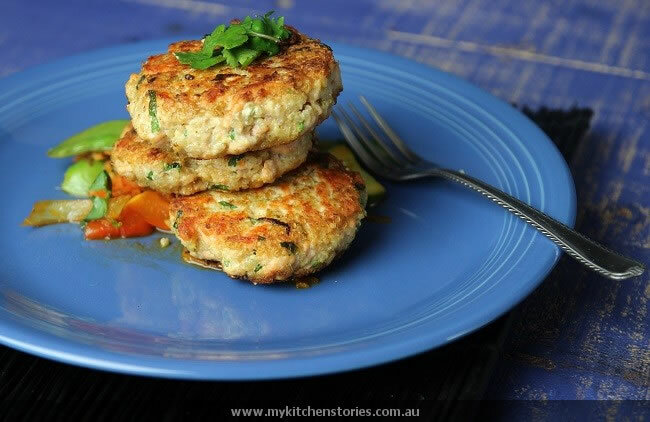 Thanks for the salmon mince idea, too (there’s a slab of salmon in my freezer that’s been awaiting inspiration) and your salmon cakes recipe sounds delicious with the sweet & sour veggies side dish. Have a wonderful adventure! I love the look of those fish cakes. I wish I could buy pre-minced salmon! What a time saver. Love the look of the coconut jam too. Enjoy the trip. What fun things – and I hope you have (had?) a brilliant time on your trip. I’m editing a Malaysian travel mag right now and have never been ;P !! Thank you so much Tania for this wonderful recipe! 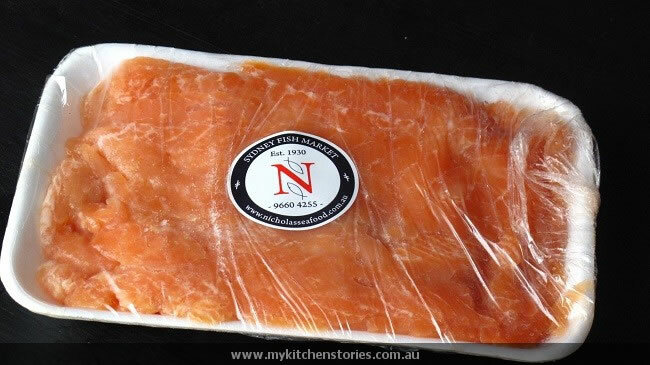 My son is a personal trainer & always nagging to make him something different with salmon! Quinoa is one of my favourite staples at the moment! and because of Celia, I have decided to ‘wisely’ Follow you! God bless your trip! Thank you Lina. I hope he likes it!